Plant an assortment of herbs in your garden this spring. They are aromatic, delicious, nutritious and environmentally sustainable in most temperate regions. Basil – has a strong, pungent, sweet flavor. It is a wonderful addition to many recipes, especially pastas, Italian sauces and tomato dishes. Basil is a good source of vitamin A, and can act as an anti-inflammatory agent. Parsley – used to flavor and garnish a wide variety of dishes, such as soups, salads, stews, and infinite others. Parsley is rich in vitamin C and has carcinogen neutralizing capabilities. Sage – a peppery herb, excellent for seasoning meats, roasts, etc. is a beautiful resident of any garden. It is a member of the mint family. Sage is believed to boost brain functions and enhance memory. Rosemary – native to the Mediterranean region this fragrant herb is used to flavor meats, stews, roasts, etc. High in iron, calcium and Vitamin B6. In Ancient Greece, young scholars placed rosemary sprigs in their hair when studying, as it was believed to aid memory. Thyme – a light flavor that blends well and does not overpower other herbs and spices . Widely used in countries from the Caribbean to the Middle East in flavoring meats, soups and stews, it is also a good source of iron. Dill – subtly aromatic leaves used to flavor foods such as fish, soups, and pickles (where the dill flower is sometimes used). In Serbia we use it to make glorious white sauces, and best potato salads. Native to Eastern Europe, the Mediterranean, and Western Africa, dill adds a tangy, refreshing flavor to any dish. Oregano – tastes range from spicy to sweet to pungent. Its delightful flavor is famous in Italian and Greek dishes. Oregano is also an effective anti-bacterial. Peppermint – a refreshing addition to summertime meals, its flavors produce a cooling sensation. It is excellent for making tea, and soothes stomach problems. Lavender – adds a lightly sweet flavor to food, but most people grow it for its singular aroma and the beauty it adds to any garden. 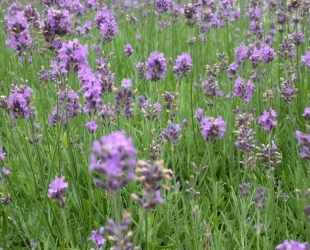 Lavender oil is excellent for healing burns, wounds, and insect bites and is used to produce balms, salves, lotions, and perfumes. My dream is pull out all the grass from the front lawn of my cottage and plant nothing but lavender. Lavender is my favorite, the oils, the dried kind in my drawers, and I make Earl Gray tea with lavender, and lemonade, too! Earl Gray with lavender, and lemonade – I never tried that. Sounds delicious. And all the seasons are covered.